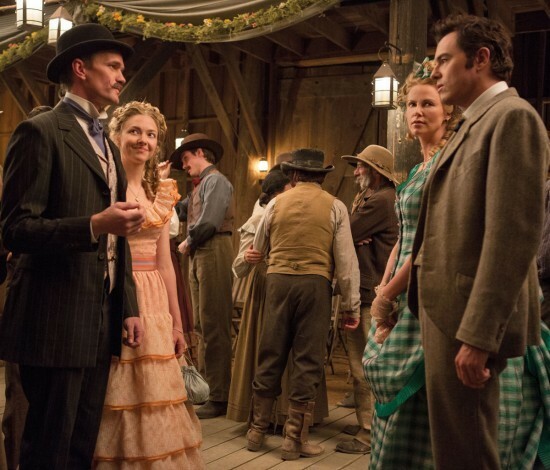 First Image from Seth MacFarlane's A MILLION WAYS TO DIE IN THE WEST! Seth MacFarlane is jumping back into the director's chair with the upcoming A MILLION WAYS TO DIE IN THE WEST. The director/co-star of the crazy-successful buddy-comedy TED is back to direct and star in the film, opposite Charlize Theron, Neil Patrick Harris, and Amanda Seyfried. The story, which looks to be a comedic Western, will revolve around a farmer who loses his girlfriend after he backs out of a gunfight. He later falls in love with a beautiful and mysterious woman who helps him to regain his confidence, only to realize that she is the wife of a dangerous and notorious outlaw. The first image from the film has been released. Check it out below. A MILLION WAYS TO DIE IN THE WEST opens May 30th.